How do you measure whether a business is a financial success? The lowest threshold is profitability, with making money being a sing of success. The next level is profitability, relative to peers, usually scaling profits to revenues (margins). The most stringent test is the value test, where returns on capital invested are compared to returns you can earn on investments of equivalent risk. I look at how firms around the world, measure up on all three measures, in January 2019. This is my sixth day to update. So my date from 2019 and this session I'd like to talk about the profitability, growth and value. If you're wondering what the distinction between the three is. Oh hang in there. When we talk about the success of a business it is true we can measure success based on what you do for society whether you read a customer need. But ultimately if you are not financially successful you're not going to be able to do any of those other things. So I'm going to focus on how we measure financial success and I'm not sure that three levels at which success is measured. The minimalist level is do you make money. Many businesses assume that they make money their successful businesses. I talk about why that's a minimalist yes. The second is the relative test. You make money but you make as much money as other companies other businesses in the same sector. And the third is what I call my that. You might make money but do you make enough money. I'm not being greedy but remember the capital you have invest in your company could be invested elsewhere making a reasonable return. And you have to make more than that to create that. So let's start off by looking at how we measure profits slash earnings. That sounds like a crazy thing to do because after all there is a bottom line in every every income statement it's a net income. But the way you measure income will depend on whose perspective you bring to the process to back it up. Let me go back to a construct I've used many times before a financial challenge in a financial banshee do of course have assets broken down into assets investments you've already made. And growth assets. The other side you've got debt and equity. If I look at income from the perspective of equity investors I'm going to be looking at income left over after expenses. Similarly look at cash flows and look at cash flows after that. That's an equity perspective if I'm look the entire business. Remember after all the entire business is funded both by debt and equity. The income I should be looking at is the income before that payments operating income. The cash flow should be before debt payments. So the perspective I bring to income and cash flows is going to depend on whose eyes I look at that at the company. With that in mind let's set up how the comparisons can be made. This is one of those very simple things in finance that people often forget. If you look at things through the eyes of equity investors you've measured come with net income you measure what your margins are relative to revenues with a net margin you measure returns by looking at return on equity the equity invested. You measure your hurdle rate the cost of equity and you look to see whether you can generate that. If you're looking at the same process of say business through the eyes of all investors including debt holders the income you look at is operating income after taxes. The margin you look at his operating income relative to revenues the returns you look at will be the return on invested capital much of return in equity and you're heard regularly the cost of capital. 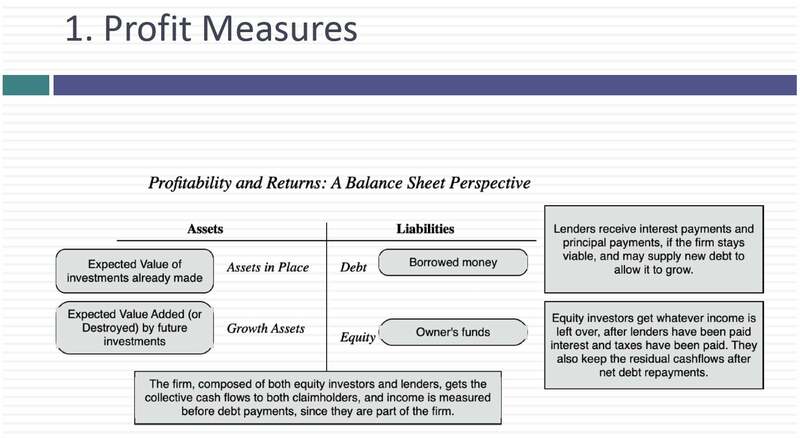 When you look at cash flows to equity investors the cash flows will be off to debt payments and cash flows to the would be cash flows before debt payments name itself. This data goes Why are we talking about all of this stuff. I want to set the table before we dive in. Let's start with the minimalist test. Does my company make money after all income coming breakevens are constructed around this structuring. Do you make money. So you are going to start off with all of that the percentage of companies that make money using the equity income test which is net income and the company does which is operating and you can see that around the world the vast majority of companies do make money across the whole world about 70 percent to 80 percent of companies make money the Australia and Canada were outliers last year probably because of their focus and that's natural resource companies. This is a minimalist test because making money is just the first step and be successful. The second step we can ask Am I making more or less money than my competitors. Unfortunately you cannot compare dollar income across companies because otherwise big companies will look much better than smaller companies. So one of the simplest ways to scale profits is relative to revenues. When I divide profits by revenues I get a margin and I can get all kinds of estimates margin I can divide net income by revenues I get net margin. I can dig operating income and divide but revenues are good operating margin. I can take off that operating income and about the revenue side going after tax operating margin or I can even divide EBITDA by revenues which case I get EBITDA margins. Remember what I said when you think about which margin to use you have to decide whose focus you'll you'll go to use a you will use equity investors focus in which case you can focus a net income or going look at it from the perspective the entire company. Again let's look at what these numbers look like globally. So this histogram I've looked at net.